Published Sunday, January 23, 2011, OK personal/derivative use; link www.lovethatimage.com. Yesterday there was a bit of sun (yay!) and I ran out to the Volunteer Park Conservatory to get some photos of orchids. I might as well tell you that I am working on a book about the flowers there, coming out later this year. My first book, and a very exciting and big project! I think I may use this image in it. Visit Today’s Flowers, Macro Friday, Mellow Yellow Monday, Macro Monday, Macro Flowers Saturday, and Shadow Shot Sunday for more neat photos with a theme (that’s what a photo meme is). Before you go, be sure to browse around here and next door at Free Photos, checking out the multitude of photos on so many topics. 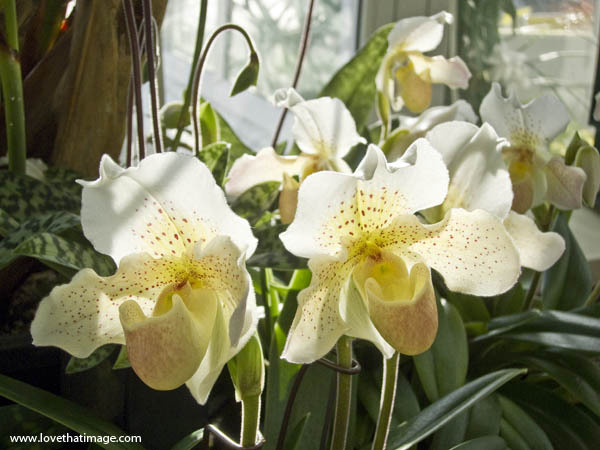 Beautiful orchids and the shadows on their petals are wonderful. Oh, they are breathtaking beautiful and the photo is exquisite. It will be a great addition to the book. I love these, beautiful lady slippers. This photo is stunning and would be a lovely addition to your book. That’s such exciting news about you working on a book! Congratulations Sara! really the frosting on the cake. Good luck with your book. Sara this is a beautiful photo and I can’t wait for your book!! Hooraly for a day of sunshine in Seattle huh? I borrowed a book with 1000 flowers. After a while, they all look the same. 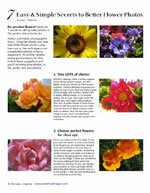 Do you know if there are single layer petal camilias? Yes, there are single petal camelias. For questions like this, I always go to google images. You will see many! Achei lindas essas orquídeas! Ainda não descobri o segredo de como cuidá-las! I already commented on this one, but there are not enough words to describe the beauty of these “picky flowers”. Beautiful shot, it makes me buy another picky orchid. lovely! I am following your blog, visit and follow mine 2! tnx.